" Articles in Category: Social Media	"
On today's BradCast, I'm your host - Angie Coiro, host of In Deep with Angie Coiro. Former Fox 'News' talking head Heather Nauert is up to replace Nikki Haley as UN ambassador. I've got the whys and wherefores on those for you. Also, Trump went into rage mode at word of his former Sec. of State Rex Tillerson's very frank discussion on Thursday at a public interview with CBS news veteran Bob Schieffer. Tillerson's explanation of Trump's incomprehension of basic issues, along with his trademark lack of discipline, provoked high-minded Trump tweets calling Tillerson "dumb as a rock" and "lazy as hell". The BBC has a good basic rundown if you're trying to catch up with the case of Chinese telecom Huawei's alleged spying. I bring you the highlights plus updated news. Meanwhile, a Swiss paper has published a conversation with Fox's Tucker Carlson who damned the White House occupant as "incapable" of fulfilling his promises. And he went further: "I don't think he's capable of sustained focus. I don't think he understands the system. I don't think the Congress is on his side. I don't think his own agencies support him." Then, legal expert and journalist LARA BAZELON joins me to discuss her work on restorative justice for wrongly-convicted parolees. She's covered the topic for years for Slate.com, and has now released a book called Rectify. The full version of our conversation will be posted here over the weekend. 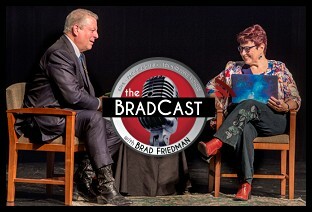 Don't wait for that, though - I've brought you a big chunk of it right here on The BradCast! On today's BradCast, I'm sitting in for Brad and Desi. Nice to be back! Today's news roundup includes this eternal riddle: is the tendency to be loathsome genetic? C.f. Trump, Trump Jr.: a deconstruction of yet another lying tweet, this time about market growth. Hint: again, TrumpCo trumpets financial news that only benefits the very few. More news: Facebook's market drop sets a record – in fact, there’s so much going on with Facebook it's sprinkled throughout the show. A nod to an excellent Charles Pierce column in Esquire. And something small but wonderful on the medical marijuana front: a jury in Dublin Georgia solemnly listened to the case against Javonnie McCoy, who admitted he had marijuana for personal medical use. And yes, that's against the law. And the jurors shrugged and sent him home anyway. Seems they couldn’t get a head of steam up about a nice guy who wasn’t hurting anyone. GARY FERGUSON, author of Land On Fire, joined me to tie the California conflagrations to global warming. This is a twofer: I include an earlier conversation I had with him on In Deep, explaining how the costs of a regional disaster become everyone's financial problem. JOHN R. PLATT, editor of The Revelator, delves into a story that's too low-profile: shockingly high numbers of attacks on and Rewire News, tallies up what’s happening in legal and political realms on repro justice issues. Lastly – it's Facebook again. Freedom from Facebook, a project of the Open Markets Institute, is one of a number of groups working to force Facebook to reform. BARRY LYNN, Executive Director of the Institute, explains how laws already in place can be used to make Facebook a better corporate citizen --- and help save news organizations at the same time. On today's BradCast, I'm sitting in for Brad and Desi, frantically sifting through news from every direction. First it's a review of the headlines, including word that the FBI has turned twelve audio tapes seized from Michael Cohen over to federal prosecutors. Donald Trump screams at Iran in ALL CAPS on Twitter; Iran snarls back. The battle over the Carter Page FISA application release rages, but one thing the GOP can't really fight back on: the case made in those pages looks pretty bad for Team Trump. A deep dive into an incredibly revealing portrait of Southern Baptist churchgoers in Luverne, Alabama. Stephanie McCrummen at the Washington Post did an amazing job on the story. Then --- in honor of Adam Parkhomenko & Co's fantastic occupation of Lafayette Park outside the White House --- a conversation with attorney SHEILA THOMAS and Martin Luther King historian CLAYBORNE CARSON. We talk about effective protest, and how the art of protest has evolved since the civil rights revolution. Finally --- did you spend money with Amazon on "Prime Day"? You and everybody else --- or at least enough of everybody else to jam up their system. JESSICA BRUDER'S Nomadland is her hands-on testament to nomadic Americans who've fallen out of the vanishing middle class, and are driving from job to job with Amazon, Walmart, amusement parks, state camping grounds, and more. On today's BradCast, I'm in for Brad again. We start by pick up where we left off yesterday, with another review of fake news - this time, contrasting it with lazy, bad, or mistaken news reports. And - about that reported book contract a flamboyant neo-Nazi is crowing about: why it's way too early to say, "We're boycotting Simon & Schuster!" Then Natalie Blake with the California National Party explains how a state can secede from the US (hint: more than one option here). This is NOT the same California independence group allied with Russia, although you'd never get that from most media. And an excerpt from a live conversation with author and culture critic Jeff Chang. Kind of fun to hear the Executive Director of Stanford's Institute for Diversity in the Arts explain how diversity is problematic.